As the ground starts to thaw and temperatures warm, it’s time to get the kids off the TV, iPod Touch and Xbox and outside to play. The task of peeling kids from their devices though isn't an easy one. The American Academy of Pediatrics advises that excessive screen time for children aged 5 to 18 can lead to increased obesity, bullying and less sleep. They recommend families develop a family media plan that reflects your goals and rules for screen time. A balanced plan that includes outdoor play, exercise and face-to-face interaction is critical for healthy development of children. Set up a fully stocked campsite in your backyard. Your campground can include a large tent with a rain fly, a fire pit (no real fire, of course, unless supervised), blankets and sleeping bags, old pots and pans for “cooking,” and a cooler with juice cartons and bottles so kids can pretend to make their own meals. When you can participate with them, unpack your propane stove and make pancakes, popcorn and s'mores just like if you were really at a state park. The bonus: You can easily disassemble the tent and take a real camping trip with your kids any time. Why keep the bean bag toss, bocce ball set and croquet stored away in the garage where no one ever remembers they exists? Get those dusty outdoor games out of the bins and set them up permanently for the spring and summer. If you don’t have many games, there’s many options for DIY carnival-style games such as bean bag tic-tac-toe, giant Connect Four or homemade Plinko. You can even keep a box of dollar store prizes for winners of games to choose from. 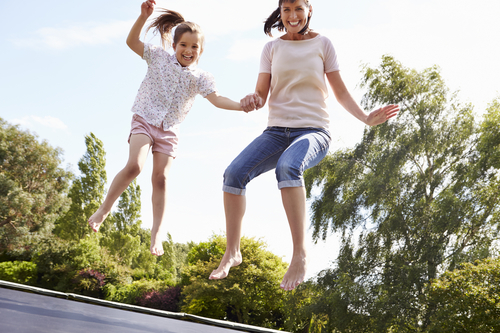 Is there a better way to get kids outside and exercising than with a trampoline? If your yard is big enough, invest in a trampoline large enough that you can join in the fun. A 12-footer is probably the minimum size for a couple kids to play at once; better to go bigger if you can afford it and have the flat yard space. When it gets really hot, place the yard sprinkler underneath and let the kids go crazy jumping and getting soaked. Another bonus: Trampolines are great for camping under the stars without a tent. If your child is an aspiring artist or loves crafting, encourage nature crafts. Use the opportunity for a little learning too. You can turn the quest for outdoor items into a scavenger hunt. Give each child an empty egg carton and ask them to find 12 unique items, one for each egg cradle. With glue and cardboard at the ready, ask the kids to then create a picture using the 12 items, gluing them and designing around them with art pens. Kids can also collect flowers and learn to dry and press them, later using the dried flowers to make an art collage. Or, keep it simple and have kids find rocks and sticks they can paint. Most important, be a good role model and demonstrate the behavior you want to see in your children. That means putting down your own iPhone. Go outside when they do, participate with them or if you can’t, find something you can do in the yard alongside them such as gardening or reading a book. Show them through your actions how fun it is to be outdoors and your kids will want to be outside more.